In 2003, Darfur started to attract the attention of the international community following the outbreak of the conflict. Since then, much is being written on what is happening on the ground, much less about the root causes of the conflict, and that is the reason why it has been looked at from a political perspective rather than from a scientific one. It has been described by many as genocide, resembling the tragedy of the 21st century. 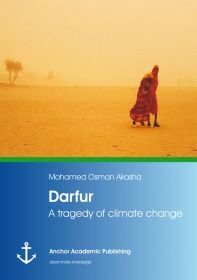 A tragedy of climate change explains how the adverse of climate change has affected Darfur since the 1970s, and how the affect has intensified since the 1980s when the region witnessed a severe drought and famine. These symptoms include the expanding desertification, the decreased rainfall and the land degradation left dire consequences. As a result, more Darfurians are competing for access to land, water, and other natural resources than at any other time. The increased competition only further aggravates the already uneasy political, social, and ethnic relationships in the Darfur region. This book seeks to critically analyze the role of climate change in intrastate conflicts in less developed countries, and links between climate change and the untraditional concept of security threats.